When you think of conditions to look out for in your aging loved one, dehydration may not occur to you. 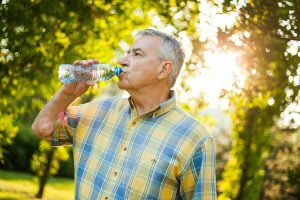 It’s true that chronic dehydration is quite common in the elderly for a number of different reasons. Dehydration is when the body is losing more fluids than it takes in, and it can lead to lots of health issues in seniors. Besides basic health problems like constipation, respiratory illness, and urinary tract infections, dehydration in seniors can also lead to kidney malfunctions, impaired cognition, slow wound healing and more. Learning the causes of dehydration in seniors can help you avoid the condition in your elderly love one. Medications: There’s no doubt that seniors take all kinds of medications for a number of health-related issues. For example, several blood pressure medications and antidepressants are diuretics and draw out fluids from the body. Difficulty Swallowing: When seniors have suffered a stroke or other paralyzing condition in the face and neck, it can be very difficult for them to chew and swallow. This can lead to dehydration and malnutrition because they avoid eating and drinking because of pain or embarrassment. Age-related Efficiency: An aging body simply doesn’t function as efficiently as younger bodies do, making it more difficult for them to retain fluid. Kidney function deteriorates and body fluid in general is lower with age. This means that being deprived of even a little liquid can tip the balance quickly from hydrated to dehydrated. Short- or Long-Term Illness: Sometimes a short-term illness can leave seniors depleted, especially if diarrhea or vomiting were involved. Long-term illnesses can also wreak havoc on an elderly person’s body and make it harder for them to stay hydrated and healthy. Hot Weather: Seniors are particularly susceptible to temperature changes and low water intake plus sweating can cause dehydration quickly. In the summer months, especially when outside, seniors should drink lots of water even if they don’t feel thirsty. Mental Illness: This is a fairly large category that can include everything from depression and anxiety to dementia. When there is no internal motivation to eat or drink, or the elderly loved one simply doesn’t remember whether they have or not, then dehydration isn’t far away. Fear of Incontinence: Many seniors struggle to control their bodily functions and worry about incontinence. Intentionally reducing the amount of water they drink to avoid accidents can have a detrimental effect on their overall health because they quickly become dehydrated. Family caregivers should be aware of some of the causes of dehydration in seniors, so they can intervene when their elderly loved one is actively or unintentionally not getting enough water into their system. The good news is that dehydration is easy to prevent. By making sure that seniors drink lots throughout the day, enjoy snacks like fruit and smoothies, and stay on top of ways they lose water, family caregivers can help seniors avoid the ill effects of dehydration.